While Autumn officially began September 22nd, and we are just 32 days away from the first day of winter, I still had some Fall Beaded Jewelry Designs to share! I know, I know. You're probably thinking (with a very confused look on your face), 'didn't she just write a winter inspired blog post?' Yes. Yes, I did. But, hey, that's how the weather rolls here in Upstate New York. Besides, you'll find quite a few people here who will say, 'Let's not rush winter already!" And with Thanksgiving just around the corner... I would have to agree. 1. Autumn weather arrived. Check. 2. The leaves started turning their gorgeous shades of russet, burgundy, deep green, rich yellow (you get the picture..). Check. 3. Autumn jewelry pictured and ready to post. Check. 4. Life happens....need I say more. But, I'm back on track and really, really want to share these gorgeous new gemstone beaded necklaces!! One (mind you, this is just one) of the things I love most about Autumn is the color. I love the rich colors, cozy colors and the combination of both! My first inspiration on the following designs were the gemstone beads I had personally hand picked. 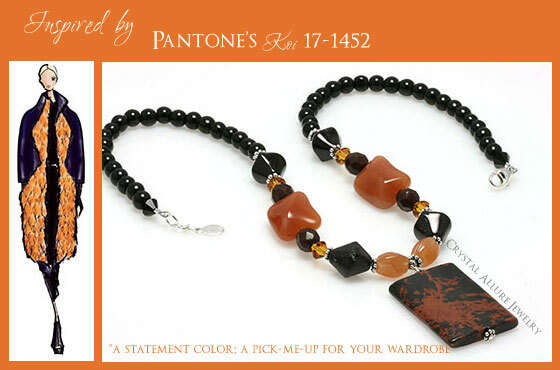 The second inspiration was Pantone's 2013 Fall Color Report. Marry these two -and viola' -instant gorgeousness you simply can't take your eyes off of! This first gemstone necklace came together after I discovered the blue crazy lace agate teardrop gemstone pendant. Isn't that mix of earth brown, meditative blue and white just stunning?! 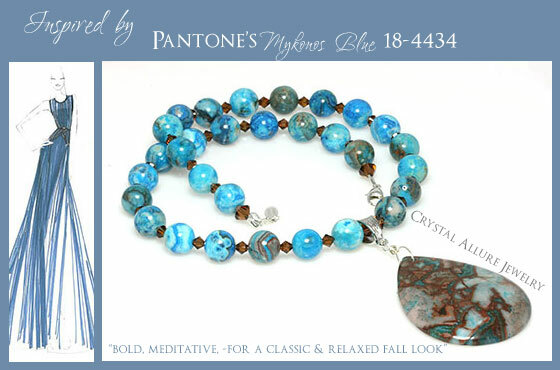 Paired with larimar gemstone beads and brown smoke topaz Swarovski Crystals and this necklace combines the beautiful color of Pantone's Mykonos Blue and Carafe! Not a blue color kind of gal? No worries. I would be shocked if you were able to resist the allure of nature's lush green. Green is such a versatile color. Wear it in spring, summer, fall and even winter if it's the right shade. 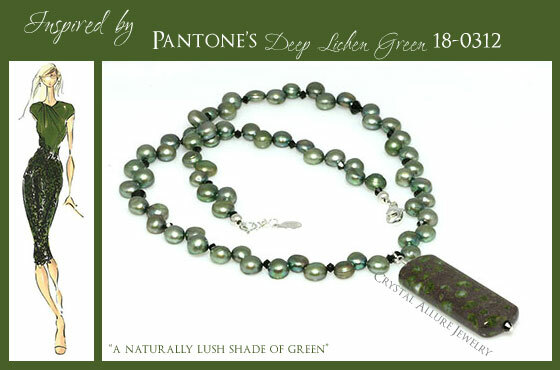 This next gemstone necklace features a rhyolite gemstone pendant reminiscent of Pantone's Deep Lichen Green color. 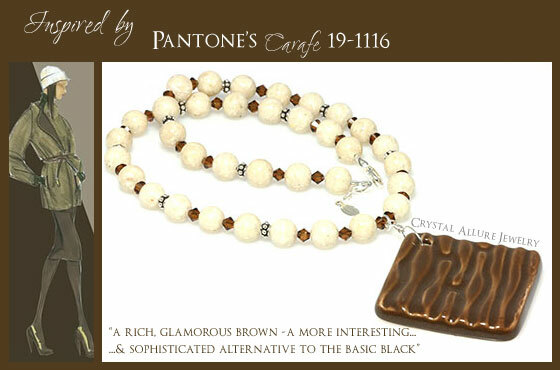 The pendant showcases a mix of green, cream and brown colors. It is paired with green freshwater pearls and jet black Swarovski Crystal accents. Pantone's Koi color is not for the faint of heart. Autumnal orange can be a challenging color to try to wear for most women. But, you don't have to go orange from head to toe. Even if you tend to wear a lot of black in your wardrobe, this inspired necklace would be the perfect compliment. It's all about using this color as an accent! And, last but not least, is a design that speaks to your sweet tooth (without all the calories!!) Pantone's Carafe is a rich, glamorous chocolate brown. Which made it the perfect inspiration for what I call my "graham cookie" necklace! I came across this rippled chocolate-brown ceramic pendant and grabbed it up. Almost instantly, I envisioned this "delicious" pendant paired with creamy riverstone gemstones and "chocolately" smoke topaz Swarovski Crystals. Mmmm! Mm! Yesterday I woke up to find the ground outside covered in a light layer of fluffy white stuff....SNOW!! I know some of you are grumbling at the thought. But, personally, I love winter. I get excited to see the first snowfall and look forward to the upcoming holidays. It's also a time when I am inspired to get back into the studio and release all the creative thoughts I've held onto since summer began. So, in the excitement of the coming winter, I'm sharing some new beaded jewelry, as well as, some restocks of previously sold out pieces. Who doesn't love snowflakes? Right?! Did you know: there are no two snowflakes alike? Well, the same holds true for our sparkling Snowflake Blizzard Crystal Earrings! Each "blizzard" of hammered, sterling silver wire is unique due to its' hand formed nature. A true one of a kind design! Baby it's cold outside! One glimpse out the window and it's a blizzard of iridescent crystal aurora borealis snowflake-cut 14mm glass beads on hand formed and hammered "blizzard" sterling silver wire. These handmade earrings are finished with sterling silver leverback ear wires. The length is 1-1/2" from the bottom of the ear wire. Are you a true winter snowflake die-hard? 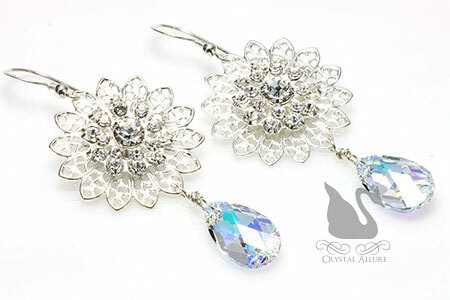 Well this next pair of handcrafted beaded earrings will offer you endless sparkle and glamour. Wear for your holiday parties into New Years Eve and even for the winter bride! 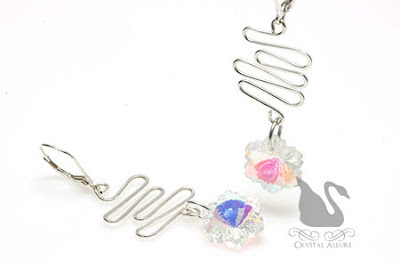 Stunning silver-plated 26mm Swarovski Crystal Filigree "snowflakes" are combined with shimmering aurora borealis (AB) Swarovski Crystal teardrops. These snowflake earrings measure measure 1-3/4" from the bottom of the ear wire. 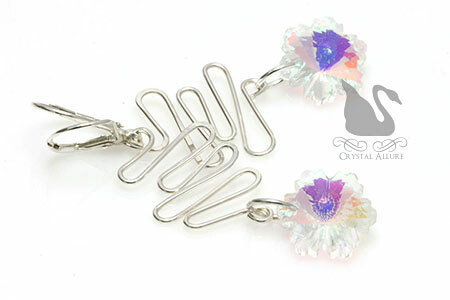 Another great pair of crystal earrings perfect for the winter bride -or even for the summer June bride because they do look like crystal sunflowers too! 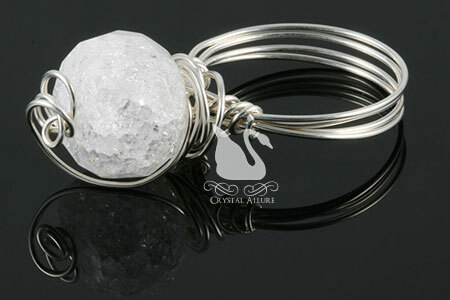 A flurry of swirling sterling silver surrounds a crystal quartz gemstone bead in this snowflake inspired handmade wire wrapped ring. Each stone, and swirls of sterling silver wire, are unique and will vary slightly from the one pictured. Currently available in 6-1/2" only. Jack Frost has nothing compared to this winter bracelet! Handmade beaded bracelet features snow jade gemstones, shimmering blue Swarovski Austrian Crystals, pearls and a lovely sterling silver snowflake charm. 14 karat gold fill beads are mixed with sterling pave' style stardust beads that mimic the twinkling snow on a sunny winter day. Finished with a blue crystal charm drop and sterling silver snowflake charm and signature jewelry tag. Measures 7-1/2".